During the third quarter, home sales in Cache County were down by more than 37%. That was in large part due to the expiration of the home buyer tax credits. Personally, I thought that during the fourth quarter we would start seeing some more normal home sale numbers. Well, it looks like from October’s home sales numbers I was wrong. 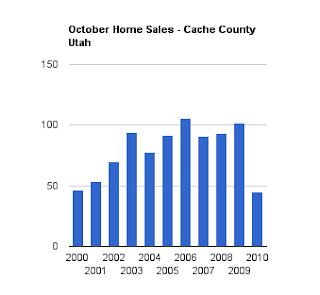 Cache County home sales were down by more 54.55% last month compared with October of 2009. Reported thus far, just 45 residential homes have been reported as sold. This is the lowest month of home sales since January. While 45, home sales is a low number for October, the 55% decline is a little misleading. The initial home buyer tax credit ended in November of last year, so there were very high home sales numbers during October of last year. From 2000 – 2004, October averaged 69 home sales each month. From 2005-2009, an average of 97 Cache County Homes sold each month. Due to the season, not due to lots of home selling, the amount of Logan Utah Real Estate is declining. We currently have 844 residential homes for sale in Cache County. This is down 3.1% from a month a go, but up 11.7% from this time last year. At Octobers home sales pace, Cache County Real Estate has 18.75 months of active inventory. via Logan Utah Real Estate Market Conditions: October Home Sales Down 55%.